Anna explains why she’s in time out. I’ve always love the changing seasons, especially here in Utah. We have hot, dry summers; crisp, golden autumns; picture-perfect Christmas winters, and a glorious new spring every year. The variety of weather and the various mountain views make life a little more beautiful. Now that we have Anna, the different seasons change our lives more than just the temperature or the view. 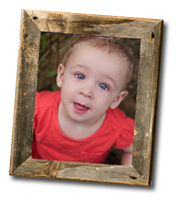 Because we want Anna to play outside as much as possible without her gear on, outdoor playtime changes dramatically in the summer. During June and July, the sun will set around 9:00 pm. In December, it gets dark as early as 5:30 pm. During most of the summer, we join Anna outside after 9:00 pm until it’s too dark to play. Anna’s bedtime, then, usually is around 11pm to midnight. 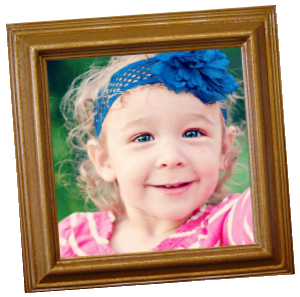 Normally, that’s way too late for a toddler – but for Anna, it’s just right. 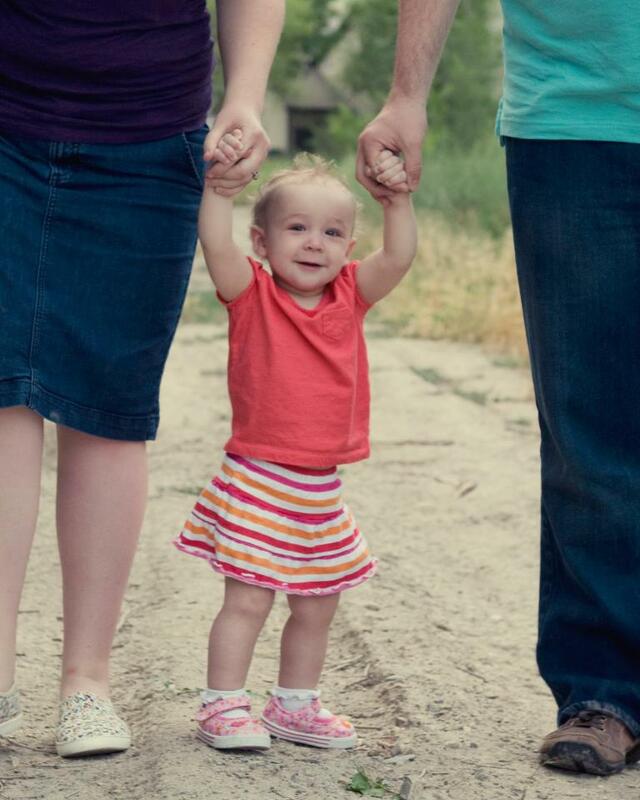 She’s a little night owl, and we’re grateful for that during the summer months. In the winter, most kids don’t play outside after 5 or 6pm, because it’s dark AND cold. So Anna staying inside during the winter isn’t very different than most kids. As summer approaches, I’m grateful for the precious hours outside after the sun has set – when it’s still warm, and Anna and her mom and dad (and the new dog Buzz) can be outside without protective gear and without worry. Our joy is full today. It is Easter, and we celebrate the risen Lord Jesus Christ. We’re grateful for His love, grace, and sacrifice. We are also joyful because yesterday we were able to spend the day outside with Anna. 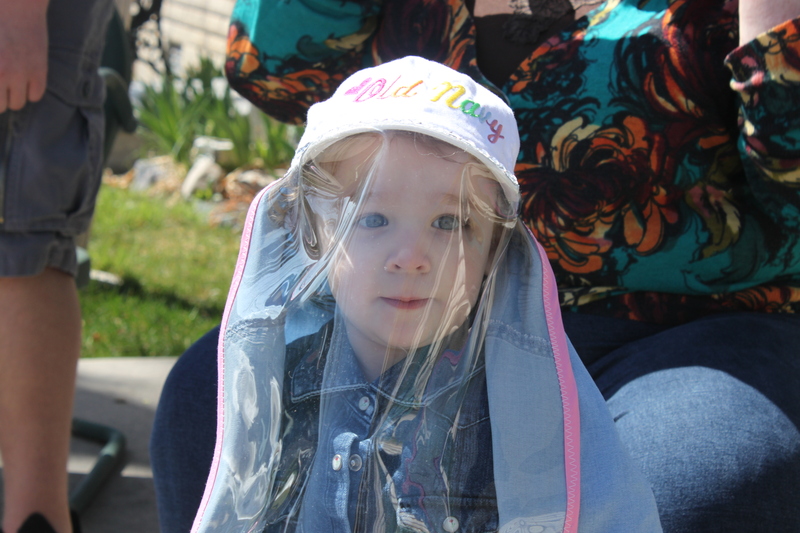 Her wonderful Aunt Linda and Grandma Debbie custom-made a hat with a uv blocking face shield, which protects her from the sun. As tradition, we gathered as family to Aunt Linda’s home for an Easter lunch complete with Easter Egg hunt, scavenger hunt, and more fun. And let’s not forget the food: dutch oven potatoes, ham, homemade baked beans, and plenty of potato chips, of course. Anna loved hunting for Easter eggs! 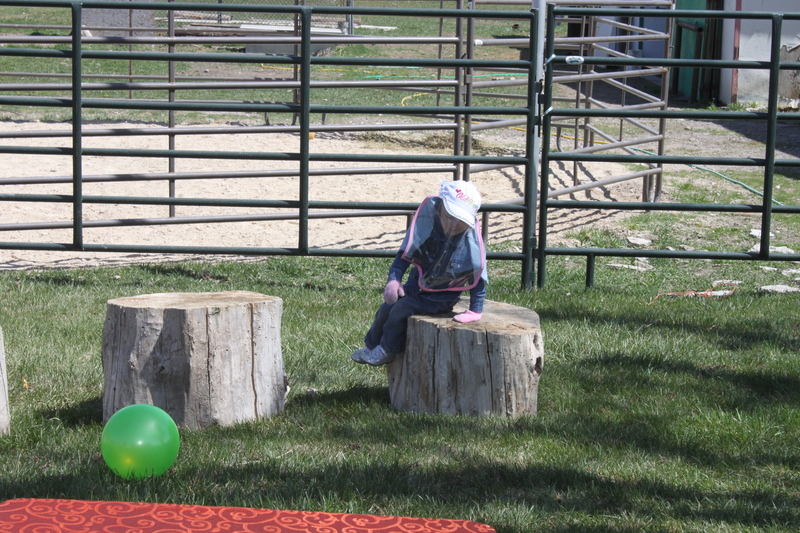 Being able to spend a sunny day outside with Anna filled our hearts with happiness. Anna had a grin the entire time as she played with our new dog Buzz, visited the horses and donkeys, and played with the other kids in the sun. 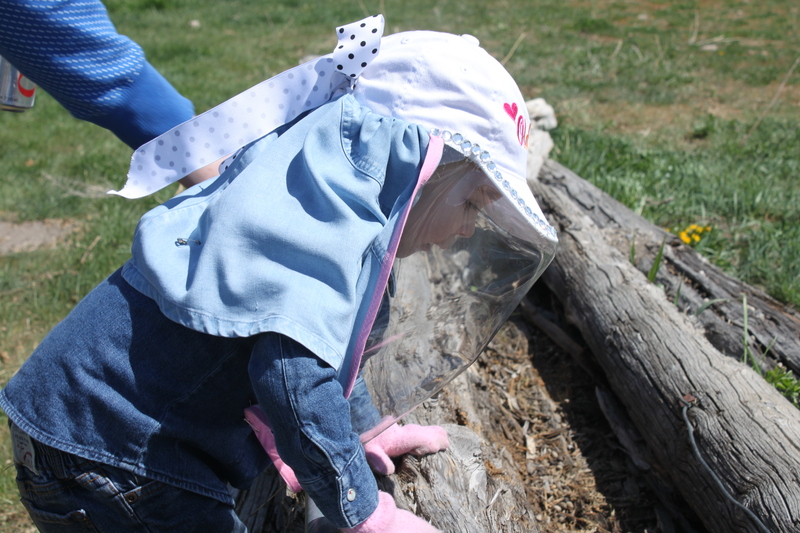 Later that night, we went to Anna’s great grandparent’s home for a hot dog roast and a night time egg hunt. 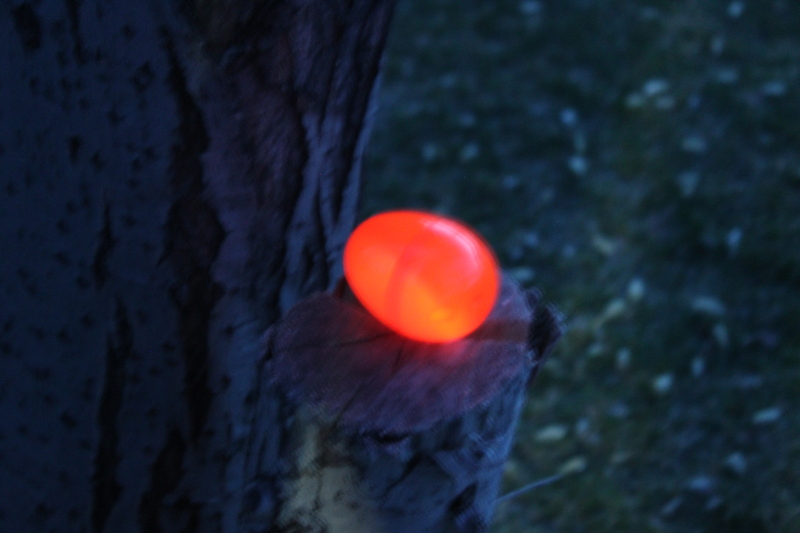 You might be thinking how that is possible – but it’s easy when you use eggs that GLOW IN THE DARK! 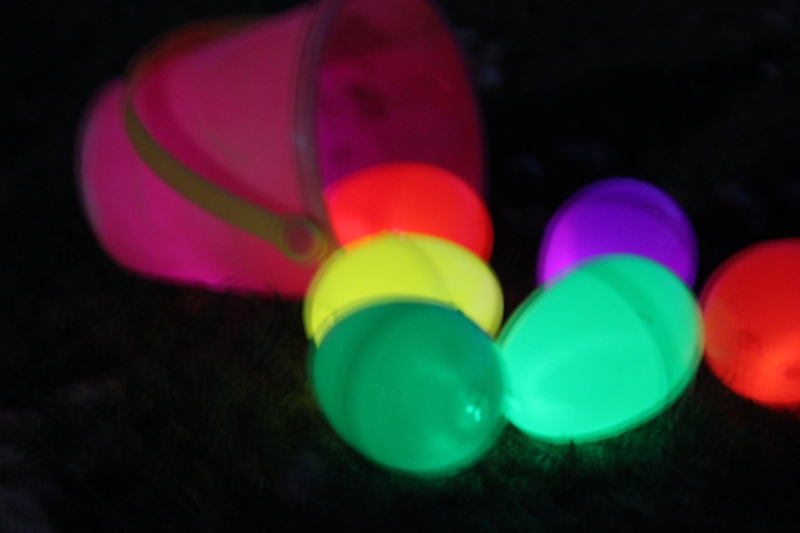 Grandma Debbie bought some large plastic eggs and glow sticks, and voila: glow in the dark eggs! Anna filled her two little buckets with all of the eggs. They looked great! It was a marvelous day and my words and pictures don’t do it justice. We’re so grateful for our family and their help and support. Today is a big day in our household. You see, the Easter Bunny (through Grampa B) brought Anna an early Easter gift. 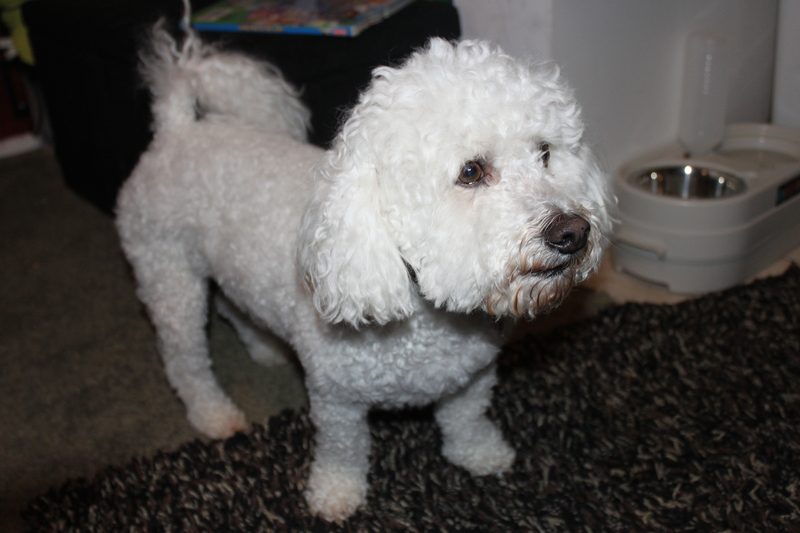 A cute little six-year-old bichon frise we named Buzz. 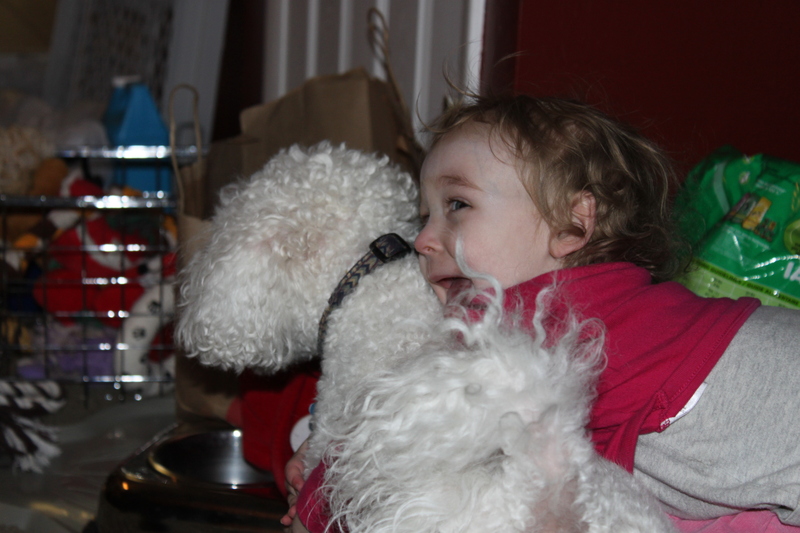 Anna instantly fell in love with this gentle, quiet, obedient dog. He can sit, shake, and who knows what else. We considered naming him Stockton, Jimmer, Billy, or Timon, but we settled on Buzz – because it will be easy for Anna to say. And Anna loves Toy Story almost as much as she likes animals. I grew up believing dogs should be outside pets, roaming free in the backyard with a doghouse. Libby grew up with dogs inside. With Anna’s XP, having a small pet inside as a friend will be a great blessing to her. Welcome to the family, Buzz! Do you have an inside dog? 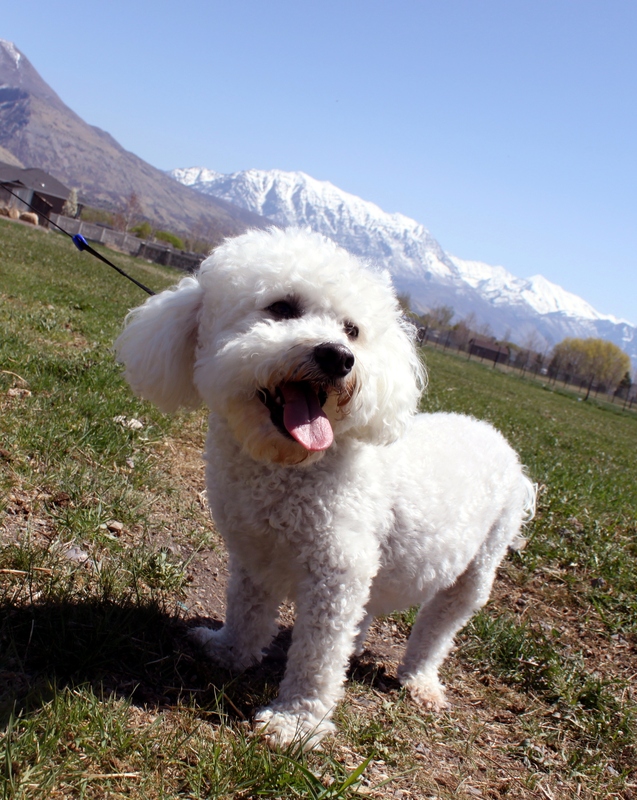 We’re new dog owners, and we’d love to get your tips and ideas on our fun new challenge.